Today I finally had a chance to try the new DualShock 4. Sure it was not plugged in, but I got to hold it and get a feel for it. And let me say, I am very pleased with my experience. While it’s hard to say how good it will actually be, when I couldn’t try the controller with a game. The D-pad felt really good, its a bit mushy and it felt really comfortable to use. But the PS3 and PSVita D-pad is a bit harder and this felt softer, if that explanation felt better. I’m really looking forward to try in out in action. The face-buttons feel good as always, though they don’t have the sorta squishiness that the DualShock 3 buttons have. While it’s hard to give more of an impression without trying I think they’ll be great. They are shorter in length and your thumb will rest better on the controller, while my only complaint on the DS3 has been that the sticks can feel somewhat loose at times that’s a “problem” that has been fixed with the DS4. The sticks feel sturdier and all-around just feel really great to use, more like the sticks on an Xbox 360 controller. And they now have concaved tops on the sticks, so your thumbs will rest on them. I think this will be a huge improvement and will make the control for games even more accurate. 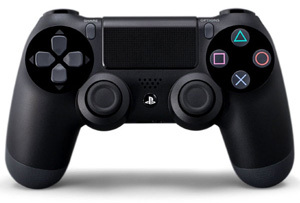 The DualShock 4 doesn’t just offer improvements over its predecessor it has a few nifty things of its own. Like the touchpad in the middle of the controller, I’m looking forward to see what developers can and will do with that. This time we’ll also say goodbye to the START and SELECT button and introduce the OPTIONS and SHARE button. Options-button will have the same function as the start button while Share will be use to start video-recording on the PS4 or take a screenshot. But the feature I’m looking forward to most and something that I think I’ll be using a lot is the, 3.5 headphone jacket on the controller. You can plug-in a handsfree headset and chat with people, but you can also choose to the games audio coming out into the controller via the headphones. A feature I wish I had a few years ago, when I was living at home and had to play with the volume very low at nights. Well these are my impressions on the controller so far, its hard to say if it will be truly great right now. But then again I doubt it. I like the DualShock controller and the DualShock 4 has improved upon everything, I’ll be very shocked if it turned out to be crap. The initial test have been great for me and I can’t wait to try it out for real in just about two days now. The time is almost upon us and damn it’s going too feel so incredible good when the wait is over! Just a three days and a few hours left until the midnight launch. Gotta get some provisions for the day of days!